This is one of a set of three photographs showing the same sphere with different lighting conditions. This shows the transmittance of this paint spheres when viewed with transmitted off full crossed polarized light. The particle appears black though it is only effectively opaque when viewed without full crossed polarized and/or reflected light. This is from an impaction air sample collected in a home. On close examination a thin film of the vehicle may be visible at the edges of the sphere. 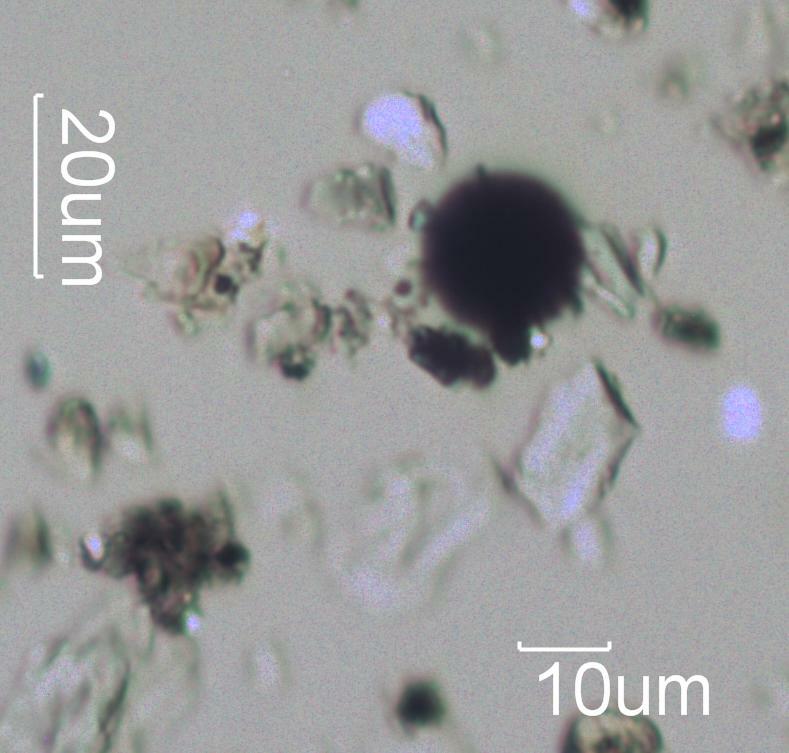 The opacifier and the pigment may be visible as particles often around a micrometer in diameter. Titanium dioxide is often present in the sub-micrometer range but its birefringence is so high that it will be visible with crossed polarized light even at that size. Bulking agents, such as quartz or calcite, is often larger and may be visible protruding slightly from the bulk of the sphere. The presence of paint spheres may indicate a source for solvent odors.